If you had to choose one winter flavor that’s all about Bengal, it would have to be nolen gur. It is at the heart of all things Bengal and sweet. You will get it in everything — from traditional mishti like rosogolla and sandesh to the contemporary dishes like nolen gur ice creams, cookies and desserts. And we found a place selling the most fragrant, flavourful variety, made without chemicals. We found this small, unassuming outfit in Kasba that is selling the best nolen gur in the city — without any of the artificial flavoring, or colour or chemicals that is prevalent in the market-bought varieties. Head to DRCSC or Development Research Communication and Services Centre, a non-governmental development organisation which works with small farmers in Bengal to promote sustainable agriculture. They sell it for INR 80 a box for the solid gur. 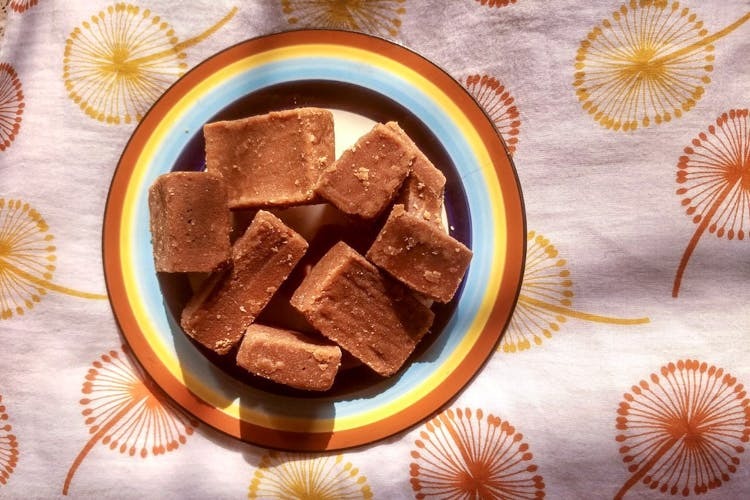 They also do jhola gur and a soft fudge-like version of the jaggery. Nolen gur or date palm jaggery is made from the sap of the date palm tree. The process takes place during winter which is also why new jaggery is available now, during our rather short cold season. You can spread the liquid gur over bread or roti, or add a trickle over your cereal or to cakes and icing. Use patali gur to make sweets and traditional Bengali desserts like payesh, pithey and patishapta.